Most Americans would have a fit if their credit card or cell phone company sent a dollar amount at the end of the month with no itemized description to match. But we tolerate it from our utility companies with little complaint. If we’re going to change our energy habits, we’re going to need more information to do it. What kinds of information motivate consumers and what kinds irritate them? OPOWER, an energy efficiency software company, is betting that a new version of an old classic — the report card — will strike the right balance. The idea is that the easy-to-understand graphics show consumers how much lower their bills could be and motivate them to get there with a mix of positive reinforcement and good, old-fashioned peer pressure. Recipients generally save 2 to 3 percent — which ain’t enough to combat climate change, but it is significant. 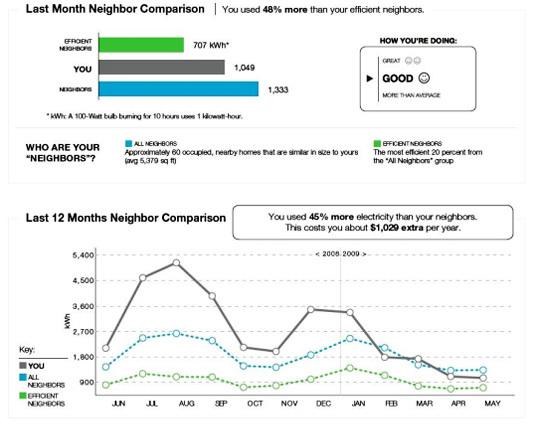 In 2009, OPOWER began sending report cards home with consumers of the private utilities Xcel Energy and National Grid. It also works with additional private utilities, several municipal utilities and energy-buying cooperatives around the country. 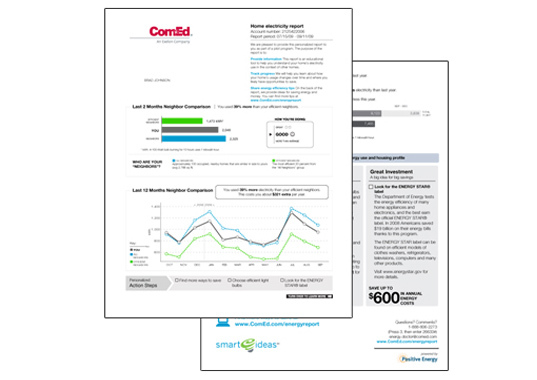 A handful of consumers have opted out, citing Big Brother concerns familiar to those who have followed utilities’ efforts to introduce smart meters; but, overall, there seems to be little downside to being graded. Of course, on the path to real carbon reductions, the report card will have to learn to play well with other energy-efficiency technologies — and so will consumers. I love this. One of the big issues with our monstrous energy consumption is that we simply have no idea how we stack up against our friends, neighbors, etc. As soon as we know how we compare, people will be stimulated to do better (at least I hope). Most Americans would have a fit if their credit card or cell phone company sent a dollar amount at the end of the month with no itemized description to match. But we tolerate it from our utility companies with little complaint. If we're going to change our energy habits, we're going to need more information to do it. What kinds of information motivate consumers and what kinds irritate them? OPOWER, an energy efficiency software company, is betting that a new version of an old classic — the report card — will strike the right balance.